Are you looking at hiring one employee or several employees? It can sometimes become a job in itself to find that perfect employee or employees for your business. This Job Applicant Data and Comparison Table helps make the task a little bit easier in hiring the best potential applicant. Download the Job Applicant Data and Comparison Table for free right here today! The Job Applicant Data and Comparison Table template is free and can be easily downloaded on this page by clicking on the download button. The template is set up with the following items in your search of the perfect employee. The list can easily be edited and information updated to better suit your needs in a potential employee. One of the powerful features of the Job Applicant Data and Comparison Table is that you can take this information based off of the sheet and sort it with any of the position applied for so you can focus on the priority upfront. From there you filter through the recruiter notes and help concentrate your focus on the applicants best qualified for the job. 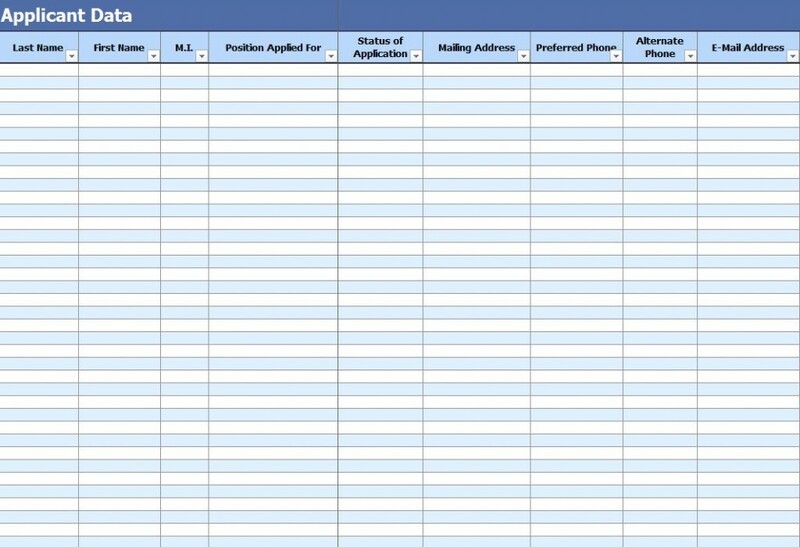 Another great feature Job Applicant Data and Comparison Table is that once applicants are declined the position you can take advantage of Excels Data Merge program and have them automatically printed out a standard “Thank you for applying… Unfortunately” letter without having to copy and paste the applicants information each time. This is a powerful and time saving feature which works hand in hand with Microsoft Word that can save you hours or days worth of work depending on the number of applicants. You always have the information for the applicants available at hand rather than having to shuffle through numerous resumes and applications. This comes in handy if you need any additional information or want to schedule for an additional interview with an applicant. Take advantage of this free and customizable Job Applicant Data and Comparison Table template and make it your own while at the same time make your job of finding the best employee.